When was the last time you stopped and really thought about time? Time is the precious, priceless commodity we all share daily in full equity; that cannot be manipulated. This situation/feeling has led me to ask myself quite a few questions about time. Should I spend time completing this task or should I pay someone else to do it? Is this (fill in the blank) really worth my time? How much time will I have to sleep? A lot of questions about time, huh? What struck me most, during my time of reflection, was the answer to my last question. Now, I’m not the only offender. Periodically, all of us let time slip through our fingers. Some of us…more than others. Do we really want to carelessly waste a nonspatial continuum that is measured in terms of events which succeed one another from past through present to future? I’m pretty sure it’s worth spending some of our precious time assessing where our time leaks may be. …and I would guess that a good start would probably be television and other technologies. These tools are a godsend just as long as we don’t get caught in the vortex of cyberspace and social media on the laptop, or zone out for hours on an iPad strategizing on how to win at “Words with Friends” and becoming an “Angry Bird” when I lose! What’s your black hole of wasted time? Imagine you had only $100 to spend for the rest of your life, and every dollar you spent would be gone forever. Do you think you would cherish each cent? Our time is like that $100. This is the only time (life) we’ve got, so we must spend it wisely; and stay inspired, it’s a lifestyle choice! ← What are you taking for granted? Time, like almost everything else in life, is a gift from God. God has said to us through the prophet Isaiah, “In the time of my favor I will answer you, and in the day of salvation I will help you” (Isa. 49:8). And since Christ has come He has been saying to everyone who will listen: “Now is the time of God’s favor; now is the day of salvation” (2 Cor. 5:20–6:2). Time, however, is running out. 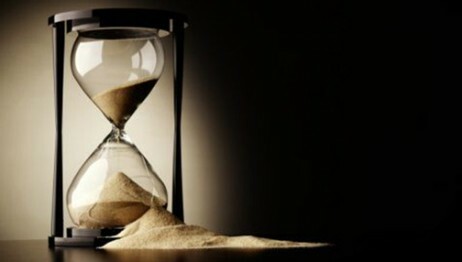 Ecclesiastes tells us there is a time for everything. But time does not stand still, it has a beginning and an end. Today we are closer to the end than we were yesterday. And tomorrow? part of the amount you had failed to use during the day. Draw out every cent, of course! Well, everyone has such a bank. Its name is TIME. Every morning, it credits you with 86,400 seconds. the person who has won a silver medal in the Olympics.